Inquisitive Myths: What are SWTOR players searching for on Google? This data is for all searches that include the word "SWTOR" that Google considers related to online gaming. Google normalizes this data, meaning that the highest search volume is assigned a value of 100, and all other data is re-scaled as a percentage of that value. In this data, the highest search volume was on release week, so the current value (37) means that the volume of current searches is 37% of release week's volume. Talk about a learning curve. As above, this is the normalized search volume of searches for the phrases "SWTOR (class)", including variations on class names (sorcerer/sorc/lightning mistress). These volumes have been normalized to the peak search volume - searches for sorcerer a week after release. Some of the search volume data makes a bit of sense. Sorcerers and Assassins (the most popular classes) are also among the most frequently googled. I choose to view this as being well informed - our storyline is, after all, about the pursuit of knowledge. Well... that or a love of ghostbusters. It is also interesting to note that the Empire classes aren't always the most searched for. In some cases - like the Powertech / Vanguard ACs, more searches are made for the Republic mirrors. 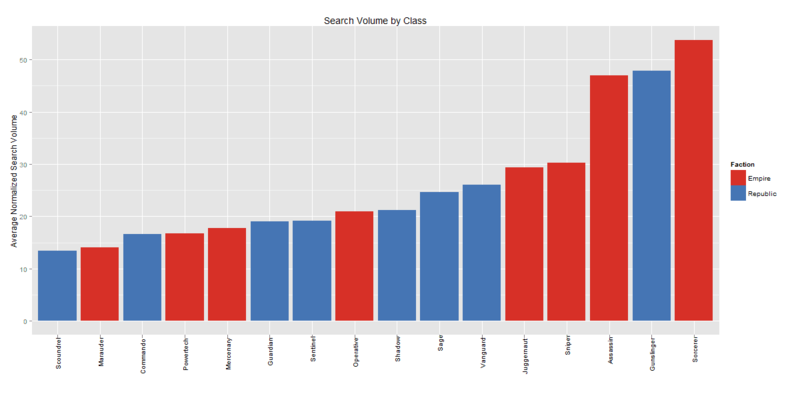 Its curious that Vanguards - the least played class - are the 6th most googled. 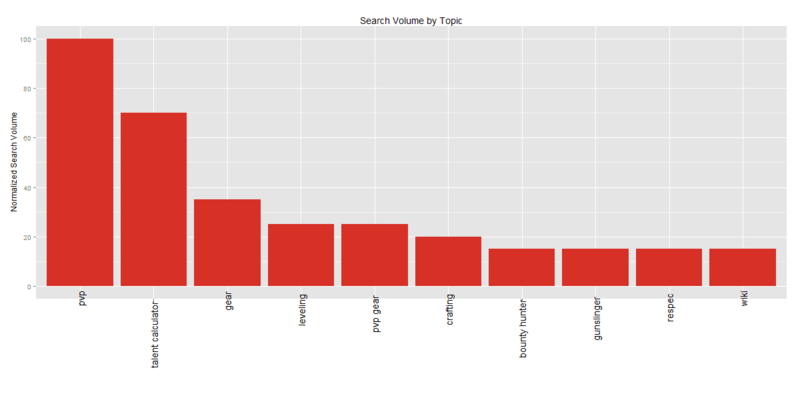 The final chart I took a look at was the search volume for the top searched phrases associated with SWTOR. Here, I grouped similar terms, so "builds / skill tree / talent tree / talentplaner" have all been grouped. 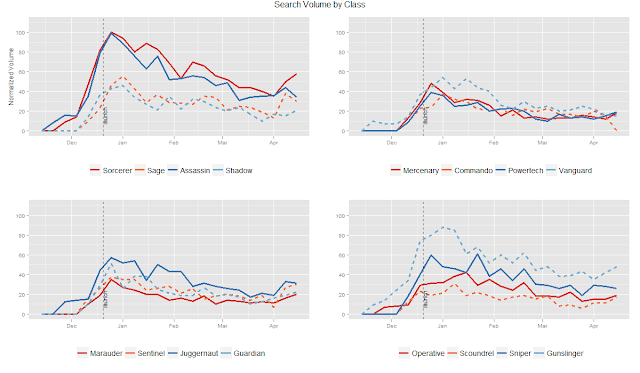 I also dropped comparisons to MMOs (for example, searches for "swtor MMO" were dropped). I don't find it too surprising that PVP (even apart from PVP gear) comes out on top for SWTOR searches. It is an easily accessible and highly rewarding form of content that tends to attract players interested in gaining the advantage. Both pve and pvp have complex gear systems, and I've definitely googled the difference between gear sets more than a few times. *Seriously, awesomeness at WoW Insider for a fun reason to play with Google Insight Data. Yup! Least played base class, fairly often googled. Gunslingers are also (at least in my mind) death-tastic to level... could be players looking for help at the pain points. Yeah that Gunslinger data surprised me too. I can only imagine lots of people have rolled alts as they look like quite a cool, fun class to play...then they get confused by the cover system, playstyle and google talent builds, what skills to use and to see if anyone else dies every other pull.